Path 1A is a seperate path to be usaed for a microphone so I can put some effects on my voice. Path 1B is for guitar and continues to path 2A. Pathe 2A splits after the amp to path 2B with a Y-split. 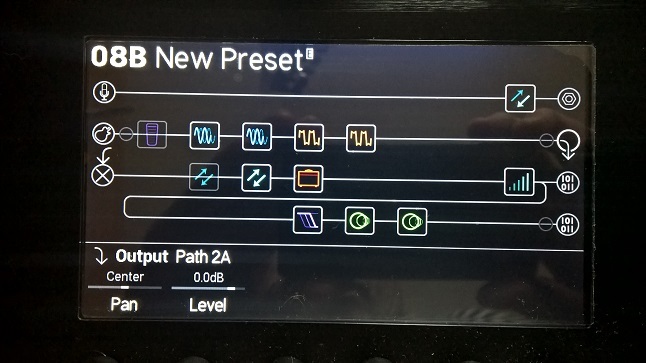 Path 2B Contains some post amp effects. I do this to have a signal without the delays going to the output as wel as a singnal with delays. This makes my guitar playing more articulate, not completely being delayed. Both 2A and 2B ar set to Digital output because I send to my DT25 through Line6 Link. If I change the output to something else I can't return to Digital. Somehow the digital output is not available, eventhough it's selected allready. Why is this? Am I doing something wrong? Is it a bug? Workaround: go to preset with a digital output and copy the output and paste it to the target preset. I think it' s a bug. If Helix sees an L6 LINK device (like DT25), L6 LINK takes over and that Digital Out parameter does nothing. Ah, that makes kind of sense. Thanks! Still, thinking about it some more I'm still confused. You say Line 6 Link takes over when Helix sees a DT25. What does Line 6 take over? It doesn't take over my signal going to XLR, so how exactly does it work?